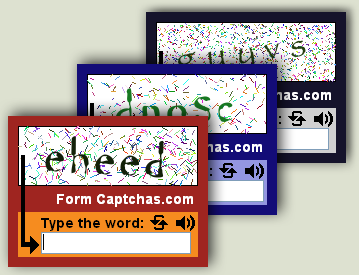 Captcha images can only be recognized by humans, and not by automatic programs such as spambots and other kinds of automatic tools used by spammers. For that reason, captcha images are the best way to protect your online forms from spam. Configure your own look & feel, including the captcha images themselves. You don't need to load the page again to verify captcha! This makes the verification much more user-friendly. Quality tech support, efficient and friendly. Free trial; always free for sites with little traffic. Our service requires less from your server than any other service of this type. No need to reload the page to to generate a new captcha image in case the previous image isn't clear. Hihgly customizable captcha to avoid spam in forms, available as a Dreamweaver extension. Allows to insert a security image (captcha) into your forms to protect it against spam.